I love talking with entrepreneurs, and I like to make a practice of asking them what metrics they find most important to watch in their companies. What’s interesting (and unfortunate) about that is that your bank balance can really only tell you one thing: how much cash you have in the bank. But what about all the other information you need to know about your company? Do you know if your products are profitable? Do you know if you’re spending enough on marketing? Do you know if a cash crisis is looming a few months down the road? If you don’t, then I’d like to share one of the most important tools for a growing business: a business dashboard. That bank balance is still important, but a good dashboard will tell you the rest of your company’s story. If the idea of a dashboard sounds intimidating (or boring), don’t worry—a business dashboard is simply a one-page graphical display of your most important business metrics. It’s something you can refer to at any moment, without needing to pull reports or make calculations. And because it’s presented in graphics rather than numbers, you can understand it at a glance without needing to comb through spreadsheets. A good business dashboard is a lot like the dashboard in your car. While you’re driving, your car’s dashboard gives you an overview of the most important data you need to know in real time—like how fast you’re going, if the engine temperature is O.K., and how much fuel you have left. If you’re only watching your company’s bank balance, that’s a lot like watching only the “check engine” light while you’re driving and completely ignoring the speedometer and gas gauge. Maybe you’ll know you’re not in immediate danger, but you’re missing a lot of other important information, and that can get you into trouble! This is why a good business dashboard (also called a “financial dashboard”) is so important for growing businesses. A simple dashboard that you feel comfortable reading will help you keep an eye on several key metrics at once, so you can focus on steering your company effectively. Building and using a financial dashboard doesn’t have to be complicated—in fact, the best ones are the easiest ones to set up and read. Here are my top seven reasons why using a business dashboard will help your business thrive, and then I’ll share some tips for building your dashboard. It’s a statistic we live by here at Palo Alto Software: Businesses that check in with their numbers regularly are 30 percent more likely to grow. Still, there’s no question that in the day-to-day rush of running a company, it’s not always easy to carve out that time. But if you have a concise, graphical dashboard that shows you the key metrics, a check-in can take as little as 15 minutes! You could get it done waiting in line at the bank or grabbing a coffee with your financial advisor. The simpler it is to check in with your data, the easier it will be to fit into your busy schedule, and the more often you’ll get it done. Just like keeping a good diet and exercising regularly, once you start the habit, it’s easy to get addicted. I guarantee that a good dashboard will start that habit for you. Another idea we talk about a lot in our company is this: You can only be successful if you know what success looks like. Growing a business is all about setting goals, and then tracking your progress toward those goals. This comparison is powerful. After all, financial data without context doesn’t really tell you much. Your forecast represents what you’d hoped to accomplish—in essence, it tells you what success looks like. And then, your actuals tell you whether you were successful in reaching those goals. As you’re setting up your financial dashboard, it’s a great time to review your business goals with your team. If everyone is operating from the same definition of success, then your whole team is equipped to make better business decisions in their various roles in the company. And you don’t have to teach your entire team how to read financial statements to achieve that goal! Giving them access to a financial dashboard is one of the simplest ways I know to provide transparency and move forward faster. Incidentally, if you haven’t already developed a forecast for your business, now’s the time to do that. It’s important here to differentiate strategic forecasting from the typical annual budgeting process. 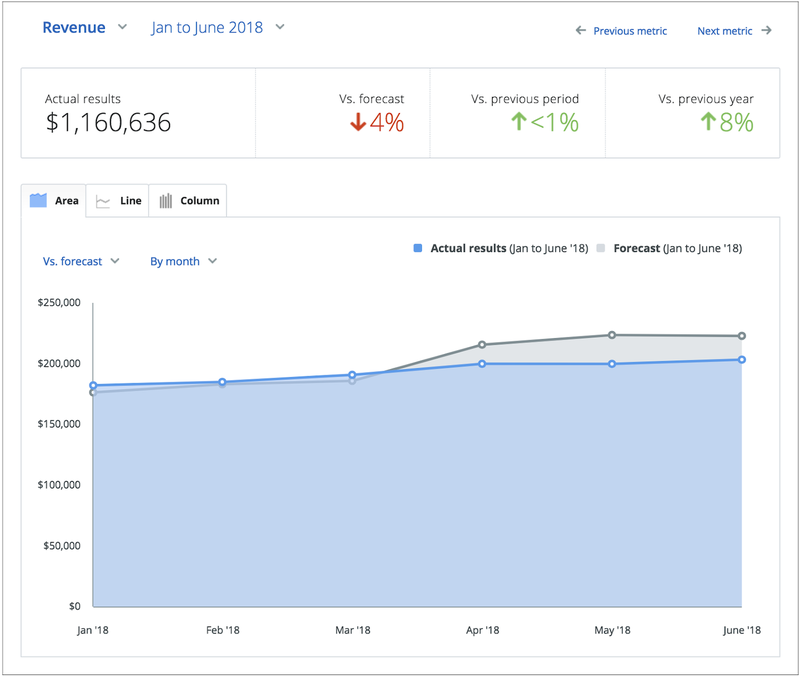 When you’re building a dashboard for your business and you set revenue targets to reach, you’re building a strategic forecast. The annual budget is different—that’s more about setting spending boundaries. Both are important, but remember: Your forecast defines what success looks like. If all of this talk of forecasting seems a little intimidating, consider working with an accountant or strategic advisor. We’ve got a directory of certified advisors who can help with both forecasting and setting up your business dashboard. If there’s one thing many of us entrepreneurs have in common, it’s that we didn’t go into business because of our love for spreadsheets and financial reports. That’s completely fine, because as it turns out, charts and graphs are significantly easier to interpret than numbers. Want an example? 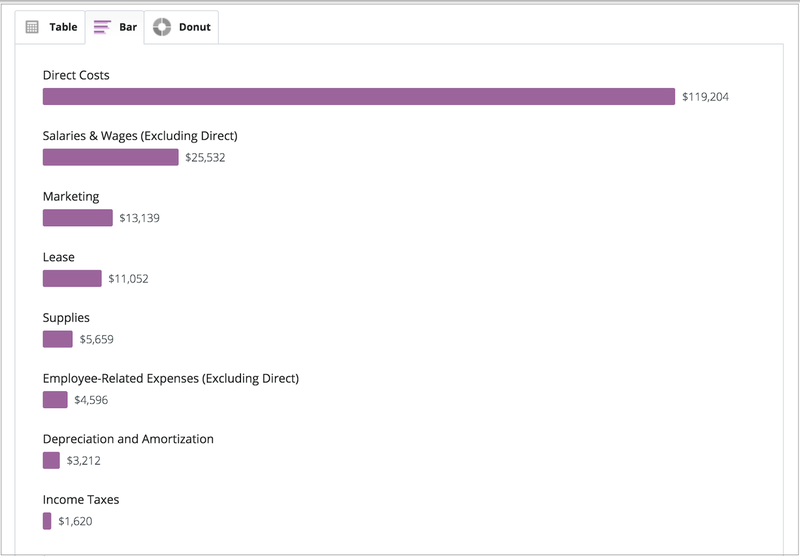 Both of the images below represent the same data: Let’s say these are your company’s overall costs and expenses. Which image makes it easier to see what the top three are? Graphical displays are great storytellers. They instantly show relative differences and trends that a simple spreadsheet just can’t show. They help you see the direction you are headed and encourage you to ask questions. When a graph can show you exactly where your business isn’t meeting its goals, you’ll find it easy and very natural to explore why things are going that way. The data helps you find the rest of the story. Immediately, you can see that over the past few months, actual revenue hasn’t been meeting your forecast. Hmmm—is this some kind of seasonal fluctuation? Well, we can see two more graphics at the top of the page that offer more of the story. Your actual revenue is right on track with the previous six months, and it’s actually 8 percent higher than this time last year. So it’s not seasonal since this same dip didn’t happen last year at this time. This decline in sales is clearly a recent trend. Armed with that information, you can start looking around your operation for possible causes. Have you changed your pricing recently? Has a new competitor moved into your market? Has your marketing spending fallen off in the past few months? The data showed you where the problem was, and then you were able to arrive easily at the right questions to ask. That’s a lot harder to do while staring at spreadsheets! This kind of storytelling (or we can think of it as sleuthing) is critical to understanding how your business can grow, whether the news is good or bad. 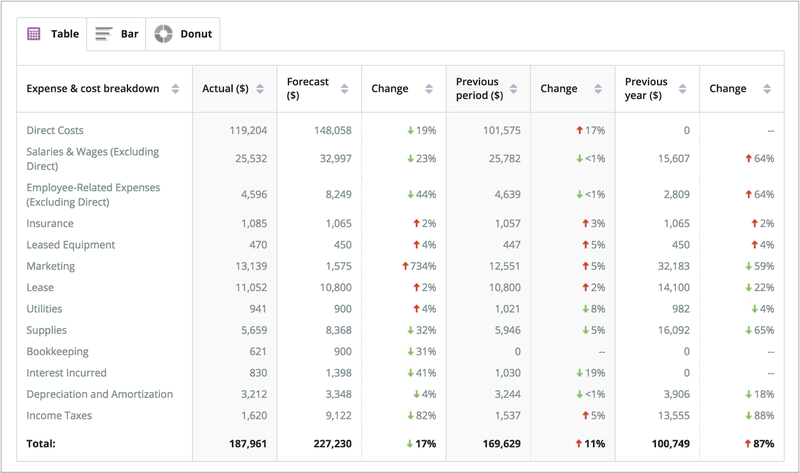 If you’re beating your forecast, for example, and doing better than the same time last year, then maybe there are lessons to be learned from your latest marketing campaigns. If you’re not doing quite as well as planned, why? What could you do differently going forward? If you’re regularly reviewing your financials, you’ll also be able to adjust your forecast in real time. Sometimes goals you put together when you started your business end up being less-than-realistic later on. Sometimes, you’ll have the excellent problem of finding that you’re consistently crushing your initial goals, and it’s time for some more aggressive ones. As I mentioned earlier, the sad reality is that not enough entrepreneurs review their key business numbers on a regular basis, let alone have a business dashboard. When you put together a solid dashboard, you gain an opportunity to stand out from the crowd, especially with your advisors and team members. Instead of just providing the same old financial reports from your accounting system, offer a visual dashboard that will spark some group storytelling—which is to say, a conversation about how to improve the business. Not only that, if you’re using your dashboard to revise your strategy on a regular basis, then you’re pivoting to more successful tactics faster than your competition. You can read more about this concept here. Here’s another way you can set your company apart from the crowd: Use your dashboard to impress your board of directors and investors. They’ll be requesting monthly reports from you, but if you instead put together a financial dashboard ahead of time, you can provide them with a rich, easy-to-understand portrait of how your company is doing before they ask. Believe me, that will set your company above others, develop a solid foundation of trust with these key advisors, and help cultivate more opportunities for you in the future. Not only that, the visual presentation of your data will encourage richer, more valuable discussions about where your company is headed. Best of all, if you build your dashboard with an online tool like LivePlan, your board and investors will be able to log in and check on your performance whenever they want. If you try to track your business with manual reporting, that can take a ton of time. Plus, if it requires a lot of effort to locate and format the data, then there’s a good chance the reporting won’t get done at all. But, if you can automate your financial dashboard so that data is imported right from your accounting system, you’ll save countless hours every month and get the information you need, just when you need it. If you’re going to build or buy a dashboard, make sure it’s as automated as possible. Hopefully, by now you’re feeling excited about the possibilities of using a financial dashboard. Building one may seem like a daunting process, but it doesn’t have to be. Here are a few tips to get you started, whether you use Excel or an online dashboard tool, like LivePlan. When you’re setting up a financial dashboard for your business, the first step is to choose the performance indicators that you want to monitor. Every business should track its cash, revenue, expenses, and profits. Beyond that, you’ll want to choose a group of additional metrics that are key to your business. Some of these you’ll review daily and others, less often. Twelve to 15 key performance metrics is a good number to aim for, but if that feels intimidating right now, don’t sweat it. Come up with a few, and you can always add more later. Here’s a good rule for deciding whether to include a metric in your dashboard: If you won’t make a business decision based on this metric, then you probably don’t need to track it. We’ve offered some advice for choosing your key metrics here and here. Once you know what you want to track, set goals for each metric. Depending on what you’re measuring, you might have a fixed target every month, or you might have different goals for different months. Remember, you’ve already done your general goal-setting work by building a forecast. Now you can use that forecast to help you formulate more specific goals for these individual metrics. Do you plan to grow sales every month, for example? Then you might set some goals for the number of new customers you’ll gain each month, or the size of the average sale per customer each quarter. This more-focused goal setting is another opportunity to get your team all on the same page. It can be a great exercise to work on your targets together so that everyone feels ownership of the goals and how you arrived at them. Don’t put off launching your dashboard because it’s not as detailed as you want or you don’t quite understand all the metrics yet. It’s more important to start tracking than to track perfectly from the outset. Try starting simply, with a pilot program. Pick a small set of the most important metrics, and track only those. Notice how being able to see these metrics in real time affects your business. Later, once you have your habit firmly established, you can expand what you track and how you track it. As I mentioned earlier, with an online dashboard tool, you can share your data with others instantly by granting them login access. But there may be cases where it would be convenient to print dashboard reports to share, or maybe download a PDF file. Think about the kinds of outputs you might routinely need, and make sure the dashboard solution you use can provide them. The key here is that a dashboard should make it easier to keep track of the most important metrics for your business. Reviewing your financials should be simple so you can spend more time developing strategies and tactics to help your business grow, and less time crunching numbers. Editor’s note: This article was originally published in 2015. It was edited in 2018.